Also serving communities of Nampa. There are 6 Memory Care Facilities in the Caldwell area, with 4 in Caldwell and 2 nearby. The average cost of memory care in Caldwell is $4,750 per month. This is higher than the national median of $4,650. To help you with your search, browse the 3 reviews below for memory care facilities in Caldwell. On average, consumers rate memory care in Caldwell 4.5 out of 5 stars. Better rated regions include Meridian with an average rating of 5.0 out of 5 stars. Caring.com has helped thousands of families find high-quality senior care. To speak with one of our Family Advisors about memory care options and costs in Caldwell, call (855) 863-8283. Caldwell is a suburb of the capital city of Boise, Idaho, and has a population of nearly 55,000 people, about one in 10 of which are age 65 and over. Currently, there are 25,000 seniors in Idaho living with dementia. The Alzheimer's Association Greater Idaho Chapter provides a variety of informational resources and supportive services to the local community, particularly those who have been directly affected by Alzheimer's disease. The Caldwell region has four memory care facilities to accommodate seniors with dementia. Three of these facilities are located in the city proper, and the fourth facility is in nearby Middleton. In most cases, memory care facilities are located within residential care or assisted living facilities that offer specialized care. 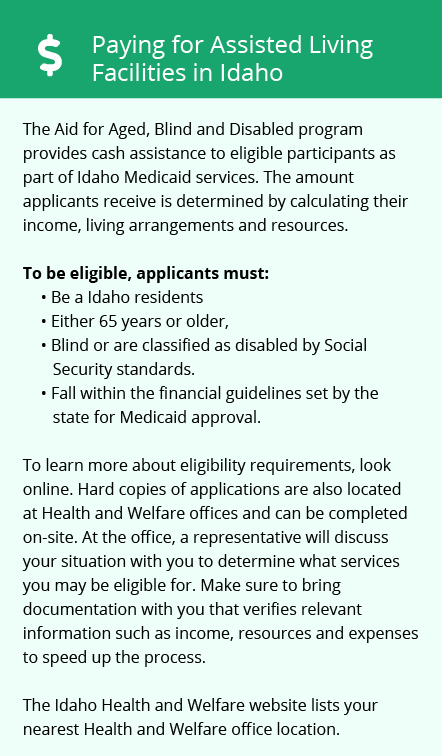 Social Security income is not taxable in Caldwell and all of Idaho, but other types of retirement income are, including withdrawals from retirement accounts and disbursements from private pensions. While public pensions are taxable, seniors age 65 and over qualify for a sizable deduction. Caldwell's climate is fairly dry throughout the year, which may appeal to seniors who find high humidity uncomfortable. Summer highs are in the low-90s and the lows are near 60, and the winter highs are in the mid-30s and the lows are in the 20s. The overall cost of living, as well as that of healthcare, is about 5 percent below the national average. This may make managing a chronic condition like dementia more affordable for seniors on a budget. Caldwell's crime rate is higher than 79 percent of the other Idaho communities but close to the average for similarly sized cities. Memory care facilities usually use a variety of means to keep residents safe, including security cameras and alarm systems. Memory Care costs in Caldwell start around $4,750 per month on average, while the nationwide average cost of memory care is $4,799 per month. It’s important to note that memory care rates in Caldwell and the surrounding suburbs can vary widely based on factors such as location, the level of care needed, apartment size and the types of amenities offered at each community. Caldwell and the surrounding area are home to numerous government agencies and non-profit organizations offering help for seniors searching for or currently residing in an assisted living community. These organizations can also provide assistance in a number of other eldercare services such as geriatric care management, elder law advice, estate planning, finding home care and health and wellness programs. To see a list of free memory care resources in Caldwell, please visit our Assisted Living in Idaho page. 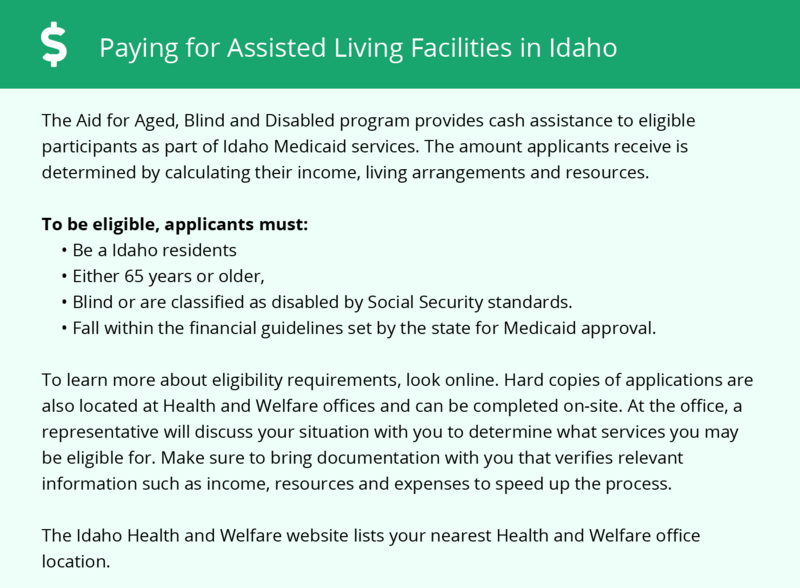 Caldwell-area assisted living communities must adhere to the comprehensive set of state laws and regulations that all assisted living communities in Idaho are required to follow. Visit our Memory Care in Idaho page for more information about these laws.